I was really pleased with this card, but I'm not sure I like how it photographed. 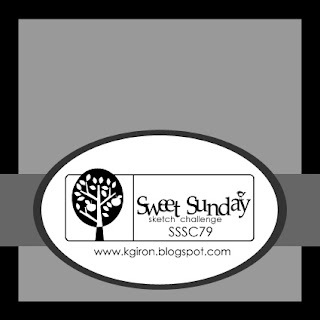 Anyway, I made it for this week's Sweet Sunday Sketch, although I didn't have an oval, like the sketch calls for. I started off stamping the various bird cages from my Aviary. This set is so stinking cute, I have no idea where to start when I look at it! I wanted to do something simple today, so I stamped them in Basic Gray ink and allowed a lot of overlap. I added a couple canaries (one is hidden under the bow), then I cut them the cages out. I layered some Greenhouse Gala DSP onto Daffodil Delight, then added some ribbon. I used Satin ribbon and Taffeta ribbon to add some varying textures and crisscrossed the ribbon slightly before tying it in a big fluffy bow. I added my birdcages with Stampin' Dimensionals, then mounted everything on my Basic Gray card. Very cute, Nina! I loce your colors!